It is common knowledge that a noisy manufacturing environment can be harmful to workers’ health. Exposure to noise levels of 90 decibels and above may even cause acoustic trauma and permanent hearing damage. What we often fail to realize is that noise also impacts productivity on production floors and in offices. Noise is a significant hazard in factories, especially in the pulp and paper industry. Loud noises and exposure to high decibel sounds can create physical and psychological stress, reduce productivity, interfere with communication and concentration and even contribute to workplace accidents and injuries. In 2014 alone, the US Bureau of Labor Statistics reported 20 900 hearing losses, including 13 700 from the manufacturing sector. Employees hear ringing or humming in their ears when they leave work. Employees have to shout to be heard by a coworker an arm’s length away. Employees experience temporary hearing loss when leaving work. In the United States, OSHA sets legal limits on noise exposure in the workplace. Its allowed exposure limit is 90 dB for workers for an 8 hour day, using a 5 dB exchange rate. 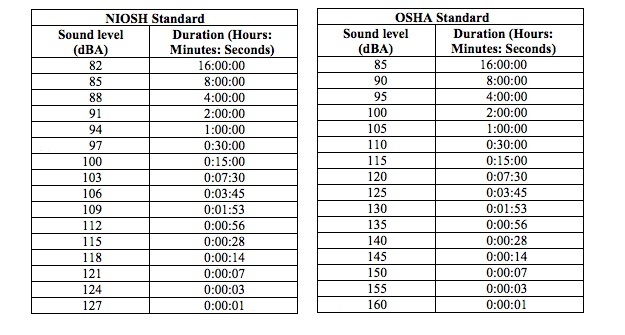 However, the National Institute for Occupational Safety and Health (NIOSH) found that significant noise-induced hearing loss occurs at this exposure level and recommends a level equivalent to no more than 85 dB for 8 hours. NIOSH also recommends a 3 dB exchange rate. OSHA is a federal organization part of the Department of Labor that enforces standards to respect whereas NIOSH recommends the best practices which have not yet been enforced by law. In Canada, most provinces set the maximum exposure to 85 dB for an 8-hour shift, using a 3 dB exchange rate. Watch a video demonstration of the acoustic performance of a control room. Determine the soundproofing you need in order to comply with the norms. Noise levels in your plant will vary considerably with the machinery in place. 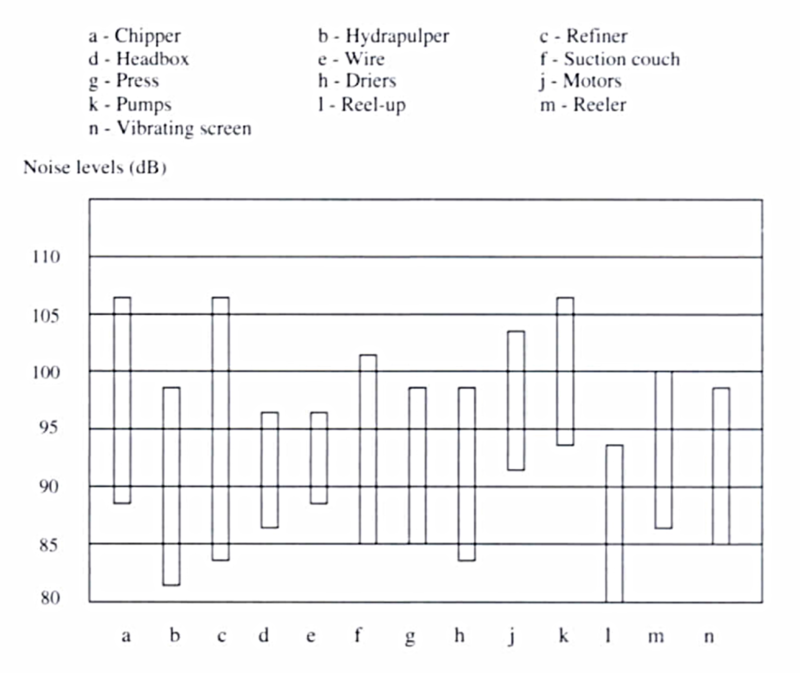 The chart below shows the noise levels at various stages in the paper-making process. Your control room and enclosure manufacturer can help you measure noise levels and compute the soundproofing system needed (at least the good ones like us do!). While office noise rarely threatens workers’ health, it can have a damaging effect on your employees’ productivity. Indeed, a study by the American Society of Interior Designers showed that decibel levels over 60 dB can reduce a person’s attention span. A typical conversation occurs at about 60 dB and many people talking at the same time can take it up to 70 or higher. A quiet office environment is set at 40-50 dB. Although office noise is rarely loud enough to induce hearing-loss and no regulations concerning office noise levels exist, a series of curves of sound pressure levels has been recommended. Among others, the American Society of Heating, Refrigeration and Air Conditioning Engineers (ASHRAE) suggests that an open office have a noise criterion range 40-50 corresponding to 49-58 dBA. Above this level, noises can interfere with voice communications and for some people even thought process. MECART’s custom-built control rooms satisfy all levels of acoustic and vibration concerns, whether you need a noise reduction of 35, 45, or 55 dB. We can even achieve a 70 dB reduction when required. Our acoustic performance is guaranteed. Unlike other manufacturers, elements such as walls, windows, doors as well as floor assemblies are each designed and manufactured by MECART to be acoustically effective alone or assembled together. All these assemblies were tested in labs, with results available upon request. We can also supply sound-absorbing partitions and noise-absorbing panels for your offices. Do You Have a Similar Issue is Your Plant? If you have noise-related issues in your plant, give us a call and we can discuss what the best option would be for you. MECART engineers and manufactures custom-designed acoustic modular buildings (control rooms, operator cabins, acoustic enclosures), noise barriers, acoustic panels, modular cleanrooms, studios, and any other controlled environment. © 2019 MECART. All rights reserved.